Historically, the Castro regime has offered three doors to political opposition: prison, exile, or death. Jorge Luis García Pérez Antúnez was imprisoned for 17 years and 38 days between 1990 and 2007 for standing up in a public square and declaring that communism was a utopian error and that Cuba needed to undergo reforms as were then taking place in Eastern Europe. When he was released from prison, and was granted a humanitarian visa to the United States to address health issues, the Cuban government offered to let him travel there but only if he did not return. He refused to leave Cuba rejecting the option of exile. In 2013 both Antúnez and Yris Tamara Pérez Aguilera, his wife and an opposition leader in her own right, traveled across the world to denounce the human rights situation on the island and then returned to Cuba on December 31, 2013. They rejected exile. The response of the Cuban government was one of escalation. Beginning on January 24, 2014 their home was placed under a security cordon restricting access in anticipation of the CELAC Summit in Havana and it has remained there until the present day. On February 5, 2014 a raid on his home followed by his arrest, following a beating, ending in the vandalizing and ransacking of his home. State security agents painted the front of his home blue to cover up anti-government slogans. Antúnez 's wife was not there having left early in the morning to attend a vigil. When she learned of her husband's arrest Yris changed course and was heading to state security headquarters to inquire about him when she too was beaten up and arrested. In addition to that she was touched inappropriately by the political police who arrested her and were making inappropriate comments of a sexual nature. On February 10, 2014 at 8:00am Jorge Luis García Pérez Antúnez initiated a hunger and thirst strike to protest the escalating State Security provocations and announced it over twitter. It did not immediately have the desired effect. Following the start of the hunger and thirst strike, state security further escalated its repression raiding the home, arresting both Antúnez and Yris, and repeatedly ransacking the house on February 11, February 13 and today February 15th. Antúnez is in bad shape. His sister, Bertha Antúnez, over twitter reports: "Today vomited bile several times with blood traces." Thankfully, after several international calls from friends pleading with him to at least drink water to give them more time to mobilize international solidarity Antúnez broke the thirst strike but is maintaining the hunger strike. The response by state security was today's raid, ransacking and detention. Within Cuba the response by other activists has been to start their own hunger strike in solidarity and in the diaspora there are those engaged in a rotating fast to demonstrate theirs. What is taking place right now is a dialogue in which the opposition on the island, the government and the diaspora are all engaged. Its painful and at stakes are human lives. What you are doing is putting your life into the hands of another person. ... You are not killing yourself but you are saying to the person that: "Your behavior is so unacceptable that if you continue it its going to kill me." It is an extreme case of taking on the suffering that is in a situation. ...This is different from a threat because what you are saying to the person is "I am going to exhibit to you, mirror back to you, the ultimate consequences of what you are doing." ... This is an act of truth. "You are killing us - you are killing our people and I'm going to show you that you are doing it to awaken your conscience. "...Thats why you have to be carrying on a conversation on a nonverbal level. Antúnez is engaged in a potentially deadly conversation with the Castro brothers and their state security apparatus when he tells them to cease and desist from surrounding his home with a security cordon, raiding his home, stealing his property and mistreating his wife. Now if this dialogue were merely limited to the Cuban government it would be suicide. This is a government that murders opposition leaders and then tries to make it look like a car accident, as in the case of Oswaldo Payá Sardiñas and Harold Cepero Escalante on July 22, 2012 demonstrates. However, this is not a two way conversation. There are other participants in the conversation: the international community, civil society (both in and out of Cuba), the democratic opposition, the general populace and the diaspora. They are all impacted to greater or lesser degrees by this hunger strike. There is a national conversation underway in the United States around the question of sanctions on Cuba. The European Union is looking to re-examine its relationship with Cuba on terms that would benefit the current regime. The Cuban dictatorship does pay attention to how this can affect their plans and interests. Unfortunately, the greater they perceive Antúnez's threat as an opposition leader the higher a price that they will be willing to pay to "let him die" or as seen over the past week to heighten the repression in order to accelerate his death. 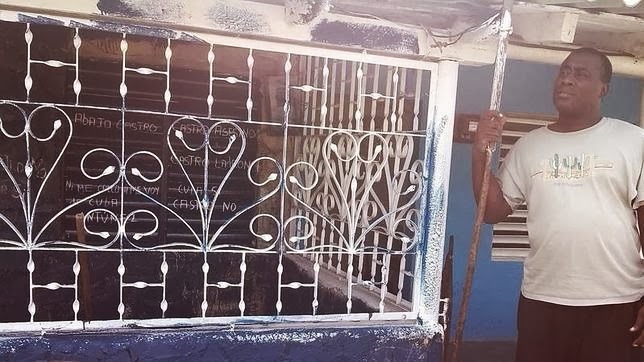 It is important to note that after the vandalism of his home with blue paint on February 5th that Antúnez took white paint and sent state security a message: "Down with the Castros. 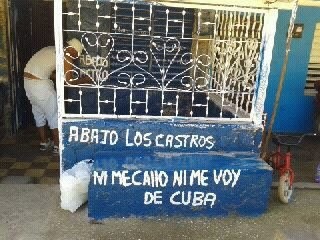 Nor will I shut up or leave Cuba." There are profound questions surrounding the decision to undertake a hunger strike, but at the end of the day it is a matter of conscience and an individual decision. However, one thing is clear if it were up to the Castro dictatorship's state security service Antúnez would die on the hunger strike removing an obstacle to their plans. It is up to the other participants in this conversation to change the regime's cost-benefit calculation in order to save the life of Jorge Luis García Pérez Antúnez. His life is not only in the Castros hands but ours as well.